I finished the Amy Butler In Stitches Bedside Organizer. 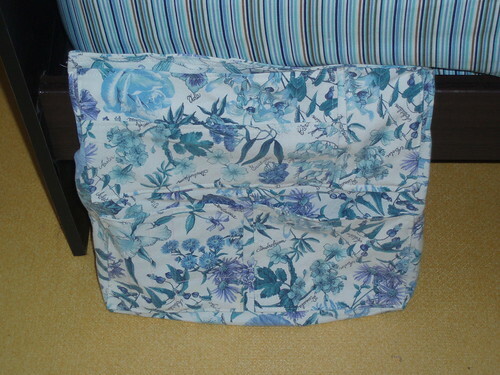 I am happy with the way it came out although I had a heckofa time with the last step – pleating the magazine pocket. It looks weird on our bed only because it’s dragging on the floor, Koreans don’t believe in box springs for some reason. Overall, it took me about 12 hours, there’s a lot of cutting involved and because of all the pockets there is a lot of stitching in small areas. I would recommend, however, that you do both sides at once and then sew them on the deck rather than sewing one side at a time as Amy’s directions call for. I made some yummy muffins tonight too. I used a Weight Watcher recipe although I tweaked it a bit to my specifications. Preheat oven to 350. Combine flour, sugars, baking powder, baking soda and cinnamon. Add egg whites, banana and applesauce. Stir until just combined. Pour into greased loaf pan or 12 muffin tins. 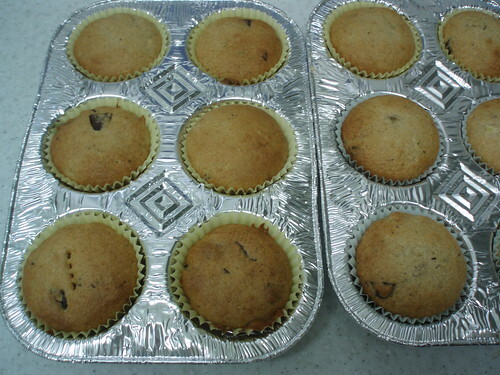 Bake 50 to 55 minutes for loaf, 20 to 25 minutes for muffins. Tweaks: Instead of Splenda I used 1/2 c. of real sugar. I also added half a dark chocolate bar, chopped up into chunks because, well, I just wanted to and I love dark chocolate. They are very moist and yummy and with the real sugar and chocolate bar they are only 2.5 points each so I don’t mind the splurge. I found you through the Amy Butler stitch-along. You are cranking right along! The bedside organzier looks fantastic.